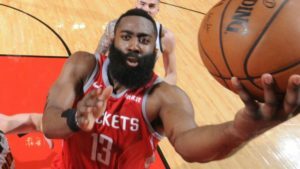 James Harden scored 38 points as the Rockets won 112-85 against the Denver Nuggets. Clint Capela had 17 points and 15 rebounds for Houston and Eric Gordon added 18 points. The Rockets are now three games behind the Nuggets, and the order could change as the regular season enters its final stretch. The Philadelphia 76ers won 123-110 against the Brooklyn Nets behind a big night from Joel Embiid. The center had 39 points and 13 rebounds, and the Nets’ playoff hopes took a severe hit. The Pistons won as well, defeating the Magic 115-98 as Wayne Ellington scored 25 points for them. As a result, Orlando’s six-game winning streak ended. Goran Dragic had a triple-double as the Heat won 105-99 against the Mavericks. Two legends faced off in their final seasons as Dwayne Wade and Dirk Nowitzki played their final game against each other. Despite being without Kawhi Leonard, the Raptors easily defeated the Knicks 117-92. Pascal Siakam top-scored with 31 points for Toronto. Giannis Antetokounmpo and Khris Middleton combined for 73 points as the Bucks won against the Clippers. Antetokounmpo suffered a knee injury, but it seems to be a minor one. The Spurs won against the Cavaliers, and Julius Randle led the Pelicans to a win over the Kings.